It’s a new year and for Diablo Ballet, it’s another year of thrilling audiences with creative, exciting and joyful performances. The second program in Diablo Ballet’s landmark 25th Season – Balanchine and Beyond – features three incredible ballets. So sit back, relax, and get ready to once again be impressed. The program opens with George Balanchine’s masterpiece, Apollo, staged by former New York City ballerina Sandra Jennings, who worked with Balanchine for more than ten years and is now a repetiteur for the Balanchine Trust. 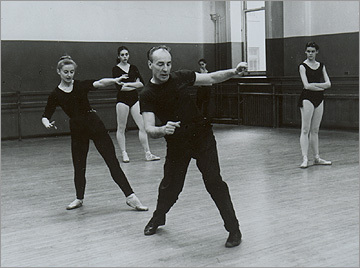 To say that choreographer George Balanchine was prolific would be a gross understatement. The man U.S. News & World Report referred to as “the greatest choreographer of our time” choreographed 465 works in his 60-plus year career. Born in Russia in 1904, Balanchine was accepted into the Imperial Ballet School at the age of 9 and, a year later, made his dancing debut in The Sleeping Beauty. At the ripe old age of 20, Balanchine served as ballet master for the Ballets Russes in Paris. Over the next five years, he created nine ballets, working with such famous composers as Debussy and Stravinsky and artists/set designers Picasso and Matisse. A serious knee injury limited Balanchine’s ability to dance, thus bolstering his time and commitment to choreography. In 1933, Balanchine formed his own company, Les Ballet, in Paris; the following year he founded the School of American Ballet with his friend, Boston-born dance connoisseur, Lincoln Kirstein. After years spent pursuing other projects separately, Balanchine and Kirstein came together again in 1946 to form Ballet Society, which later became the world-renowned New York City Ballet. Apollo, considered one of Balanchine’s most innovative ballets, combining classical ballet, classical Greek myth and images and jazz movements, depicts the young god as he is inspired into adulthood by the muses of poetry, mime, and dance. The three muses, wearing brilliant white costumes, dance solo variations before Apollo performs a pas de deux with the muse of dance. With this dramatic and powerful ballet, which created a sensation when first performed, the 24-year-old Balanchine achieved international recognition and began his long-term collaborative partnership with Stravinsky. The 1928 premiere of the ballet featured sets and costumes by French painter André Bauchant; the following year, new costumes were created by famed fashion designer, Coco Chanel. Diablo Ballet Artistic Director Lauren Jonas agrees with these accolades. One of her favorites, Diablo Ballet first performed Apollo in 1998. “Every time I watch it, I am reminded of George Balanchine’s genius. His use of musicality is masterful and the Ballet is absolutely timeless. You can’t tell where the music is coming from – the musicians or the dancers,” she said. 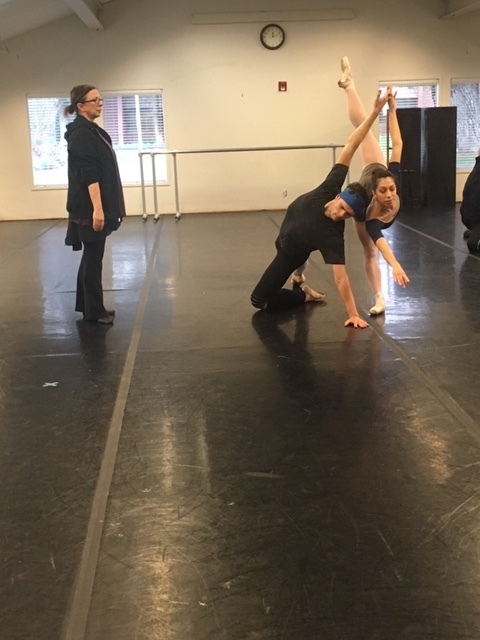 Sandra Jennings works with dancers Amanda Farris and Raymond Tilton. As a young dancer, Sandra’s goal was to dance for Balanchine’s company. “I loved the freedom of the dancers, loved his choreography, the music and the costumes” she said in an interview several years ago. She also recalled a conversation she had with Balanchine in the mid-1970’s when he said to her, “One day, you will teach for me.” He was right; the Balanchine Trust hired Sandra as a full-time repetiteur 12 years ago and since that time, she has been traveling the world setting Balanchine ballets.